There are two main Lawson admin tools that you should know about: the Role Manager and the Personalization Manager. These tools are only available to those users with Portal Admin access. The Lawson Role Manager should not be thought of as a security tool, but rather as a way to tailor the presentation of Smart Office for a group of users. Users are assigned a portalrole attribute in Resource Management or Security Administrator and this value, the name of the XML file containing role properties, is used both by Lawson ISO and Portal/Lawson Ming.le. For that reason, if also using the Portal within your organization, you would want to use the same role names for both, though the properties for each are very different and stored in separate locations on the application server. 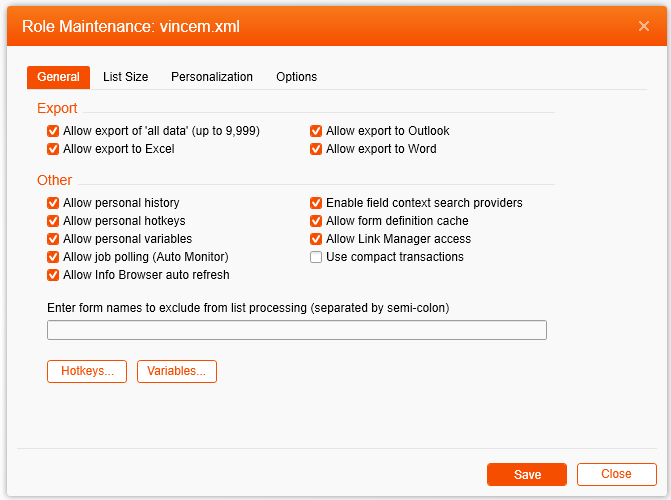 General – This tab contains settings that control a member’s ability to export data and other personal options, many of which may impact server performance. Also List Driven forms can be excluded from list processing by entering the tokens names here. Role level hotkeys and variables can be defined by clicking the associated button. List Size – This tab contains settings that control the number of records returned in various lists: List Driven forms, the Info Browser widget and Drill Select. Of course, the larger the number specified here the greater impact on server and client performance. Personalization – On this tab the member’s Personalization level is set: User, Central or None. User and Central are most common selection. None would mean no personalization will ever be applied or available. If User level is selected, all the various personalization features are available to be enable or disabled. If Central level is selected, only the Allow Select View setting is optional. Options – This tab contains various options for defaulting certain user settings at login and possibly disable the ability to change in the User Settings dialog. Typically, these features are little used but do offer some flexibility. For example, admins may not want user’s to be able to see but not change their Data Area. Or since the default for Use List Processing is false, you may want to default it to true and disable input. More information can be found in the subchapter Creating Lawson Custom Roles Using Role Manager in the Infor Smart Office Administration Guide. 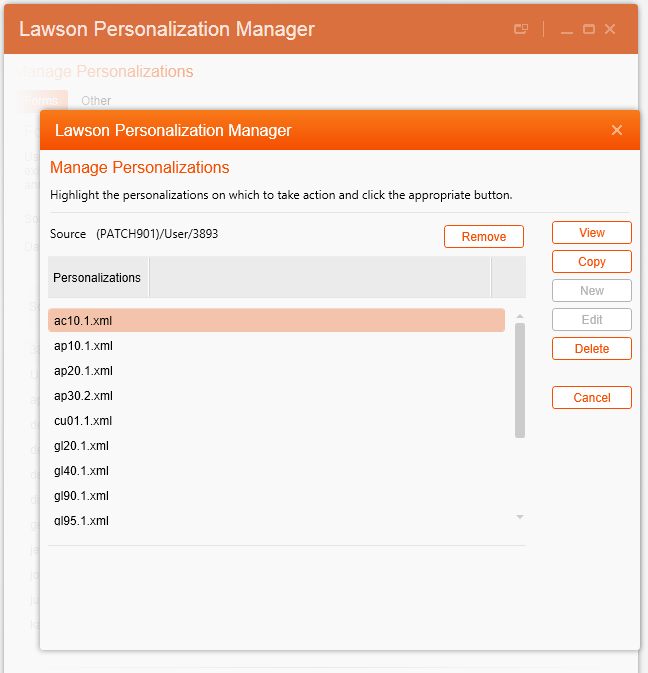 The Other tab of Personalization Manager provides the ability to view, and delete other types of Lawson personalizations: Application Lists (List Driven forms), Info Browser, Drill Select, Jscript and Hotkeys. Most of these types of personalization apply only to users – no Global or Role versions exist, with the exception of Jscript files which are Global only and Hotkeys which may have both a Role and User version. As such, Hotkeys files may be copied similar to forms personalization files. More information can be found in the subchapter Working with Lawson Personalization Manager in the Infor Smart Office Administration Guide.